Verbal Assault is a 1-vs-3 mic minigame in Mario Party 6. The name of the minigame also refers to verbal abuse, in which one person abuses their victim verbally to gain the upper hand. This is the only Mic minigame to have a different tune playing in the background which is "Tenacious". 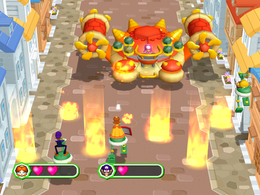 Each member of the team controls a small walker with a rapid-fire cannon and two large shields on their front. They run down the road in pursuit of the lone player, who is given control of a massive battleship. 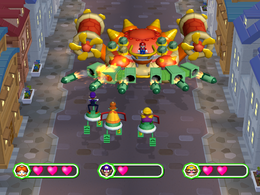 By speaking certain phrases into the microphone, the single player can perform different attacks to try and hit the team. The other three players must avoid the battleship's attack while returning fire with their walkers' cannons. The single player has to hit each walker three times. The walkers' health is represented by three hearts on the bottom of the screen, as well as by the condition of their machine: the first two hits knock off one of the walker's shields and the third hit destroys it. After taking damage, a walker becomes briefly invincible, allowing the player to reposition themselves and prepare for the next attack. On the other hand, the team of three has to hit the battleship with hundreds of shots, but without worrying about it becoming invincible. The battleship moves from side to side, but its size means that most shots will hit it regardless. Its health can be estimated by looking at the green crystals near the cockpit; as it takes damage, the crystals will fade to red and pop off of the ship. The game ends when one side defeats the other. When this happens, the players will be seen outside of their machines-with the loser's vehicle(s) broken and emitting smoke-and perform their victory/defeat animation depending on whether they won or lost. "Fire" – Two flamethrowers sweep the area in front of the battleship. They have short range, and can be dodged simply by keeping away from the battleship. "Laser" – The battleship fires two large beams straight down. It can be avoided by staying to the sides of the road, or by staying between the lasers. "Missile" – The battleship fires six missiles in a spread formation. The team should move between the missiles (easier if they are far away from the battleship). "Drop Bombs" – The battleship launches multiple bombs from a hatch on its top. The bombs hit random areas of the road, exploding into pillars of fire that linger briefly. "Bullet Bill" – A Bullet Bill is launched from the battleship. It moves slowly, but homes in on an enemy. "Goomba" – Multiple Goombas jump out of the battleship and roll straight forward. If the microphone fails to recognize any of these commands, the battleship will display an animation of gears being dropped, while the player on board looks distressed. This is not an attack: the gears have no effect and disappear after a moment. Rules – "One player commands a heavily armed battle craft. The other three have to destroy it!" Advice 1 – "As the battle craft takes damage, green capsules will break away." Advice 2 – "Wait until the battle craft finishes an attack before saying another order in the Mic." This page was last edited on October 28, 2018, at 19:47.